Carrot Revolution Art Company. We are a group of artists in the Seattle area. We share beauty, art, and nature. Our group name comes from a famous quote by artist Paul Cezanne: “The day is coming, when a single carrot, freshly observed, will set off a revolution.” We are a company of artists who observe the world with fresh eyes. Plus live music by Lesleigh Reinfried on the piano. Artists present. 2D and 3D works; textiles, pastel, ceramics, photography, pen & ink, polymer sculpture and more by Doriane Nieburgs, Leela Pastala, Angie Whitney, Lois Gaylord, Frances Herring, Aaron Taylor, Kristol Jones, Abbie Deleers and Phil Keane. Artists present. Open only until 8pm. Featuring mixed media, watercolor, graphite and sumi ink work by Anita H. Lehmann, Architect. About the artist: My natural tool is the pencil or the crayon; the single line and the limited palette require the artist to tell the story of that place with a crisp economy. Color, temperature, movement, and character are evoked in a few swift strokes. For me as an architect and illustrator, the drawn line evokes the honest nature of a place, expressing—literally—weight, value, and tone. These media—the pencil and the crayon—capture the loose realism of the edge places which then dissolves toward abstraction. I received training in architectural drawing at the University of Washington, and freehand drawing in Rome. I am a current member of the American Society of Architectural Illustrators. 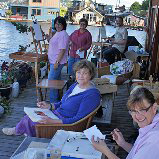 I give drawing lessons at my studio, on the edge of downtown Seattle. Artist present. Vollan, whose works on canvas, panel and fimo clay describe tales of heartache and adventure, take place in the city of Rusted Gallows, populated primarily by friendly skeletons. The characters in his works demonstrate that there can be contentment and hope in an otherwise dilapidated world. Shore is a tattoo artist at the Greenwood-based Fist Full of Metal Tattoo Studio, and previously apprenticed at Under the Needle Tattoo Studio in Seattle. 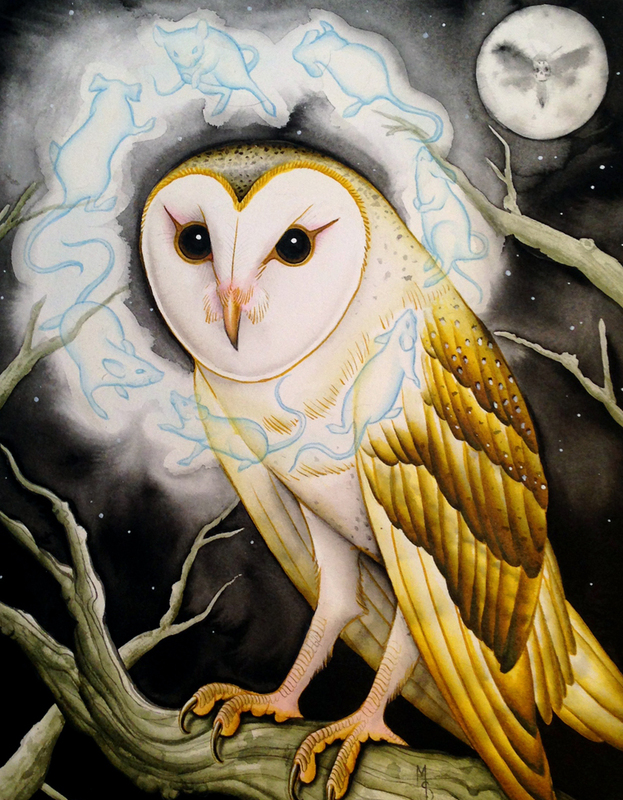 She also studied printmaking at Emily Carr University in Vancouver, BC. Both artists painstakingly create pieces that discover the essence of life after death and find the loveliness that lies within the unknown. Artists present. Live Music by MAX DE BERNARDI & VERONICA SBERGIA–PNW FOLKLORE SOCIETY COFFEE HOUSE CONCERT. Free. Presenting contemporary art work by gallery artists. Artists present. Featuring art by Jesse Card and Elise Koncsek. Jesse Card has a variety of laser cut and engraved works on wood, metal, acrylic, and glass. Many of reclaimed materials. From photography “printed” on wood to custom-made lanterns and luminaries. Elise Koncsek has works of her own design in laser-cut wood as well. She also has a variety of custom jewelry and photography. She specializes in nature photography. Artists present. 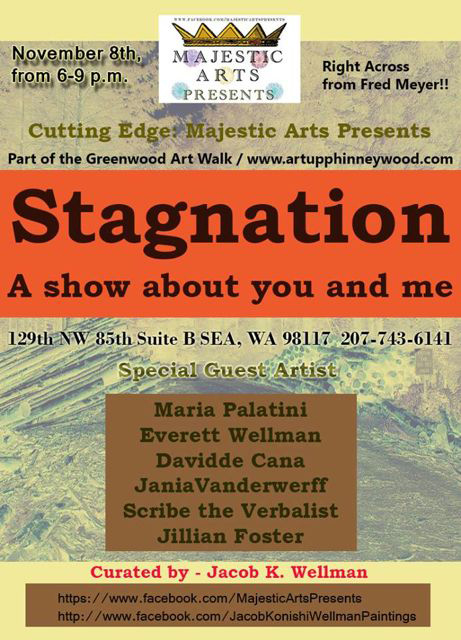 “STAGNATION” A show about you and me! Artists: Maria Palatin, Everett Wellman, Davidde Cana, Jania Vanderwerff, Scribe the Verbalist and Amy McCalab. Visual art with mixed mediums. Curated by Jacob Wellman. Artists present. Featured artwork by Fritha Strand. “Acrylic, spray paint, watercolor, gouache, charcoal, chalk and oil pastels are the mediums I use, typically on canvas or board. I like to give the material and mediums some control, embracing mess-ups or rash decisions in an attempt to discover the painting. They build toward me.” – F. Strand. Artist present. 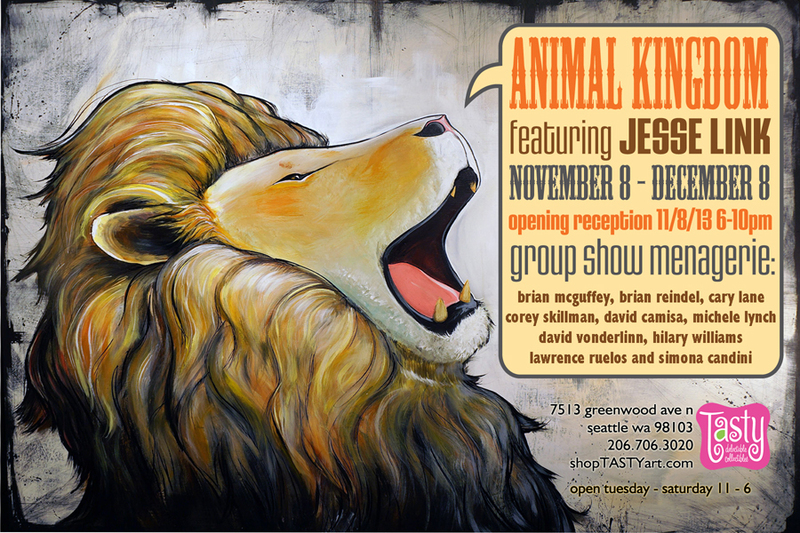 Our next Tasty art exhibit (Enchanted is running currently, through November 5) will feature Seattle artist, Jesse Link and include a group show menagerie of: Brian McGuffey (WA), Brian Reindel (WA), Corey Skillman (WA), David Camisa (BC), David Vonderlinn (CA), Hilary Williams (CA), Lawrence Ruelos (WA), Michele Lynch (MO) and Simona Candini (FL) with new animal pottery by Cary Lane (WA). Seasonal artists whose work we carry on the other walls of our gallery include: LE Giclee’s by Justin Hillgrove of Imps & Monsters, Glitter Stencils & Paintings by Sarah Chambers, Mixed Media sculptures by RedHardwick, Mosaic Glass Mirrors by Olvera Designs, Paintings by Wilky, PinUp Girls by Brenda Dunn, Spray-Painted Stencils by Court Hoffman. Artists present. “4Teen” illustrations by Abi & Emma plus round 2 of “Vibrations” by Deb McCarroll. Drawings, Paintings, Sculpture and jewelry by Scott Faulkner, Pamela Faulkner, John Schmeising, Tom Dougherty and Dalton Webb. Artists present. *Venues offering artwalk discounts & specials.